Though the EOS 5D Mark II has a much greater pixel count and smaller pixel pitch (6.4×6.4 microns vs 8.2×8.2 microns) than its predecessor, the photodiodes on the new camera are larger. In addition, the microlenses that cover these light-sensitive cells have been made larger and more transmissive. Our tests indicate that this has helped Canon overcome one of the most common concerns of an increased pixel count – a reduction in the dynamic range. In fact, the EOS 5D Mark II has the same dynamic range as its predecessor (11EV) and the graphs are identical. 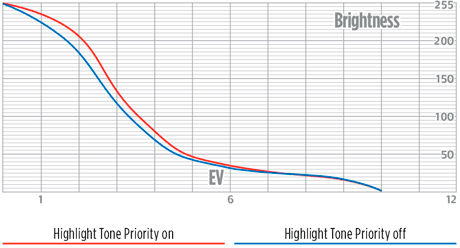 However, when the Highlight Tone Priority mode is activated this effectively extends the Mark II model’s range to 11.5EV. In practice, the impact of both Highlight Tone Priority and Auto Lighting Optimiser is very subtle. When set to the Adobe RGB colourspace, the Canon EOS 5D Mark II produces JPEG images that exceed the sRGB gamut, and provide more subtle red, blue and purple gradations. 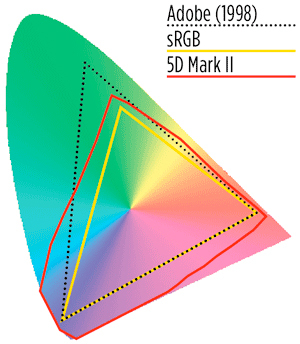 However, like most cameras, it cannot replicate the full range of green tones of the Adobe RGB colourspace.